Welcome back to another exciting edition of Saturday Night Movie Sleepovers! Dion Baia and J. Blake are kicking off week one of their 2016 October-Halloween binge, where they ‘up’ their ‘output’ and deliver one horror-themed podcast a week for the Autumn month. And the boys are kicking off October with a real favorite here at SNMS, a film that spawned a life long love affair with John Carpenter, horror, and quite possibly became the catalyst for one of the guys to even attend film school. 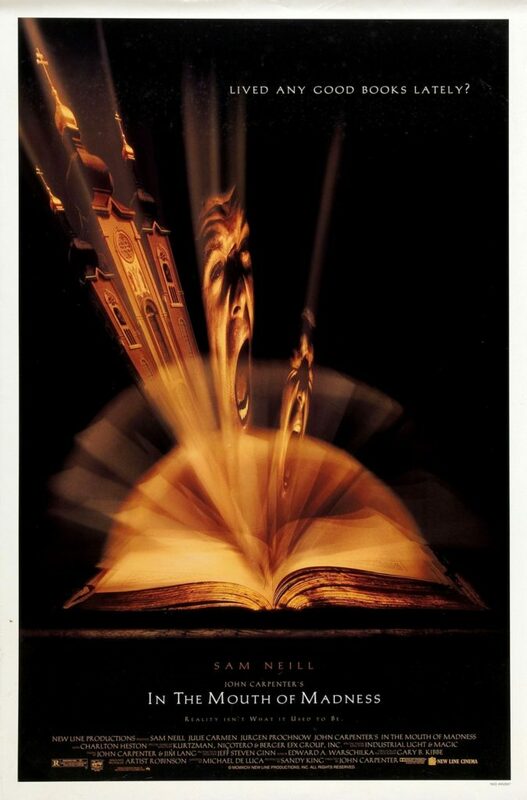 That movie is the aforementioned director John Carpenter‘s masterpiece, In the Mouth of Madness, from 1995. Do you read Sutter Cane? The fellas start out the podcast discussing the maestro himself, John Carpenter and Blake‘s two interviews he did with the director that are part of Blake‘s new book Scored to Death: Conversations with some of Horror’s Greatest Composers. Dion jokes about the rumor among their friends that maybe it was in fact Blake who put the seed into Mr. Carpenter’s head to release a new music album, and then to tour. They talk about their mutual background of making home movies with their friends growing up, but specifically the huge inspiration In the Mouth had for Blake when he first saw it while in High School and it turning a ‘light’ on deep inside of him, perhaps even giving him the inspiration to go to film school as well as steer him toward his passion for horror films and their music, which then led to an entire book on the subject. The guys then segue and talk about the background of this film In the Mouth, beginning with the influence the huge pillar, H. P. Lovecraft, had on the horror genre on a whole, and then what elements were distilled into this work. They attempt to analyze and dissect what is and is not reality within the story and the blurred lines that are presented… which lead to some burning questions: Are we already seeing these complicated and convoluted themes within our own culture, vis-à-vis the television reality show industry, which now seems to have set a standard for our entertainment or even how we live and what we consider now our reality? How about in book form, as in the film’s plot- can a book series like Harry Potter or Game of Thrones be real life examples of works of fiction that have taken off and become their own entities, much like Sutter Cane’s work? Even though this story is not based on an actual HP Lovecraft work, can this be categorized as a continuation in the lore and tradition he started almost 100 years before? Well all these questions will be attempted to be answered in this exciting ‘first Halloween 2016 installment‘ of Saturday Night Movie Sleepovers! Here is the original trailer to In the Mouth of Madness. Have a look and listen to John Carpenter and his band perform the In The Mouth of Madness theme Live at the Retrospective Concert at ACL Moody Theater in Austin, Texas. Check out John Carpenter himself chat in 2007 about H. P. Lovecraft and In the Mouth of Madness. Take a look at this featurette for In the Mouth of Madness! Have a listen to the soundtrack to In the Mouth of Madness!